Next chapters will describe the process of creation a report, also will demonstrate Code Behind feature. Next tutorial chapters will require non free tariff (see Tariff Activation chapter). Lets suppose you want to create a Report based on orders information. 2) Coding step - working with source code implementing report logic using Code Behind feature. 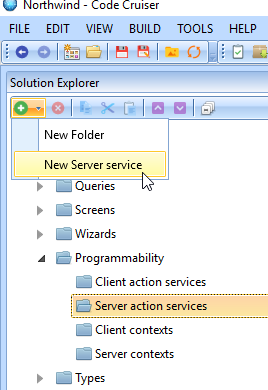 Create new Server Action Service by selecting Programmability->Server Action Services section and pressing Plus Button->New Server Service. Set its name to Reports. Select newly created service and press Add. Select created Action1 action. 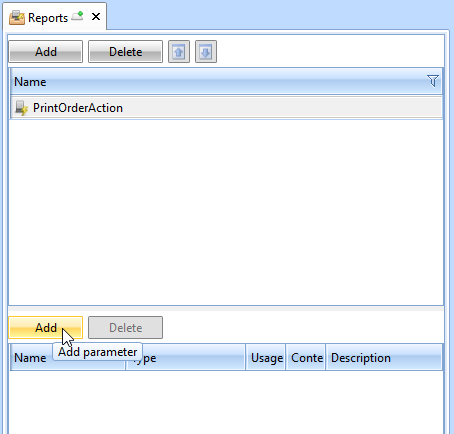 In properties set Name to "PrintOrderAction" and Result to "Report". In a lower part of a from press Add. This will add a new parameter to an action. This parameter will be used to pass order id. 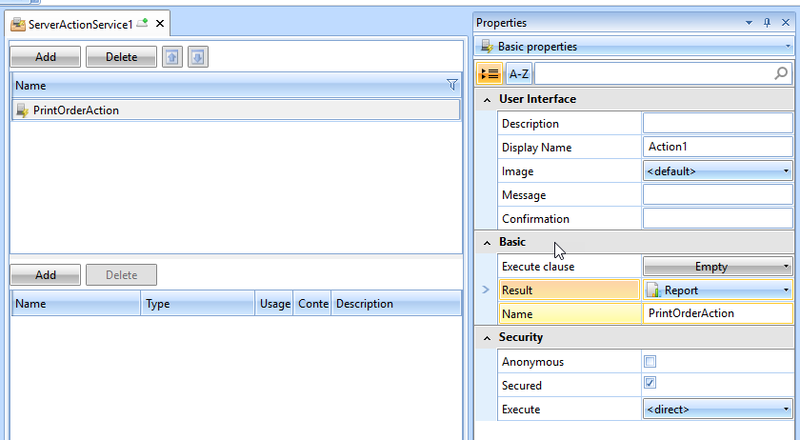 Set name of the parameter to "orderId" and type to "int". 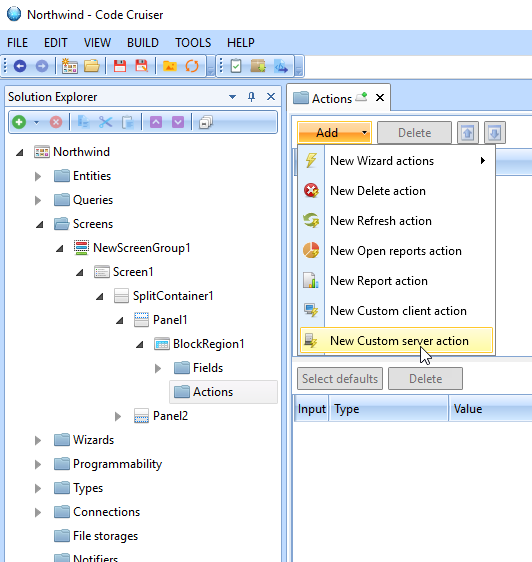 Let's back to Screen to setup an action to call server service action. 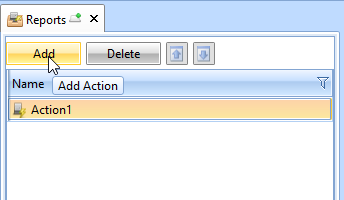 Select Action section of BlockRegion1 and press New Custom Server Action. In a lower part of the form set parameter value for orderId to BlockRegion1 (Orders) - Id. 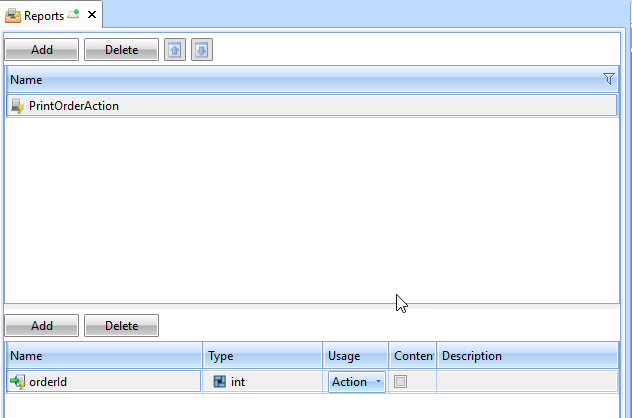 Configuration step for adding new report is finished.